“Discreet oasis of understated chic and calm”: this is how best to describe this unique rooftop Penthouse on Ahad Ha’am. Perched on the 3rd and 4th floors of a charming townhouse, this vast duplex Penthouse is located in the heart of the residential ROTHSCHILD area, the historical Bauhaus and Israeli art village-like neighborhood. It is also ideally situated at the crossroad of the beating business/cultural/nightlife hearts of the White City. Avid shoppers, fun-seekers, urban explorers and business travelers will love this unassuming Penthouse, ideally located in the City’s most vibrant Rothschild/Allenby belt, home to myriad swanky restaurants, trendiest nightlife spots and cultural venues. Also one block away from the Shuk HaCarmel and Neve Tsedeq, your stay will never be dull! This unique nest offers a great base from which to explore Tel Aviv and where to cocoon after a hectic day, a serene getaway peacefully overlooking the buzz of urban life. It will perfectly fit both your tourist outings, working stays, family times or romantic getaways. This particular house building is a striking example of the eclectic architectural style popular in the 1920s, comprising Art Nouveau elements fused with Art Deco and Classical influences. The eclectic mix of unique wall arts, stylish furnishings, and antique trinkets in the Penthouse creates the sense of a private house, a perfect combination of warmth, authenticity and contemporary. You’ll feel like you’ve taken in the home of a modern-day wildly treasure hunter! On the 3rd & 4th floors with elevator, the Penthouse (150 sqm) comprises 3 bedrooms and 3 bathrooms (1 suite with king size bed and bathroom, 1 bedroom with queen size bed and 1 bedroom with 2/3 single beds). The bathrooms feature brand new walk-in Italian shower. The apartment can very comfortably sleep up to 6/7 pax. The sun-drenched vast open plan living space on the top floor connects the living room, the dining area (10 pax), the TV corner and the kitchen. 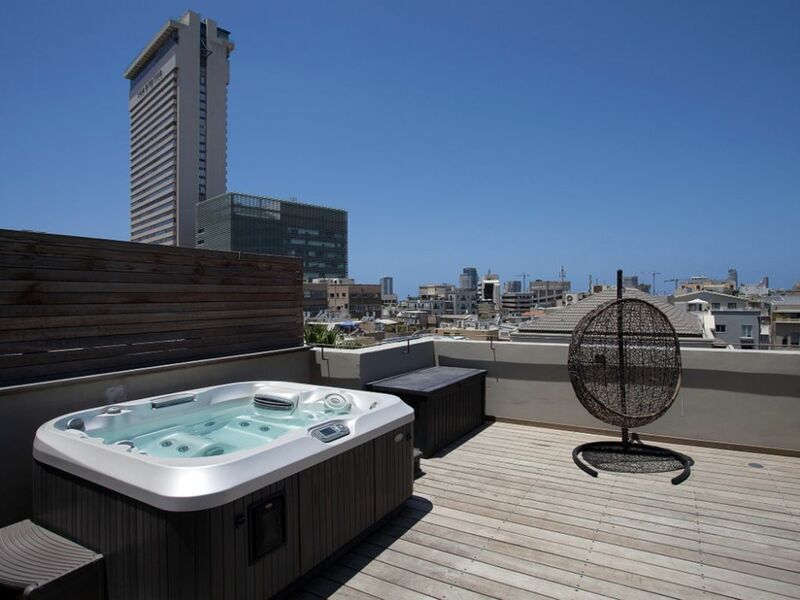 It opens onto 2 fully furnished rooftop patios with jaccuzzi and breathtaking 360• views of the downtown Tel Aviv skyline. The kitchen is fully equipped with gas hobs, oven, microwave, dishwasher and Nespresso machine, etc. Security is enhanced by both building and apartment coded entrances, as well as a private lift hall to the Penthouse. Home is not a set house, or a single town on a map. It is wherever the people who love you are, whenever you are together … Home is people, not a place ... Home is a moment, and then another one, building on each other, like bricks, to create a solid shelter … Home is what you take with you wherever you may go. Life takes you to unexpected places, then love brings you Home … Home is where the heart is! What we love most about our Homes, is who we share them with! Believe it or not, our Homes notice when you are no longer there … and they long for you to come back again … with love! We strive to create true Homes from Home for you, charming gems with attention to every detail, infused with a friendly atmosphere of genuineness, sharing and tasting. We look forward to welcoming you Home! You will warmly be greeted by Elie & Carole, two very friendly Superhosts who will care of you during your whole stay. They speak English, French, Spanish and Hebrew. Exceptionally well connected to the city’s public transportation services (Rothschild/Allenby): 8’ to the Central Bus station with bus/sherout 4; 10’ to Ichilov Hospital and Arlozorov Central Bus and Train station with bus 18; 20’ to Tel Aviv University with bus 25; 10’ to Jaffa with bus 25, 125. Self-service bicycle rentals station around the corner. Haben zu zweit in Tel Aviv Urlaub gemacht und zwei Wochen das Appartement gebucht. Nicht günstig, aber jeden Cent wert. Normalerweise sieht es auf den Bildern ja immer besser aus als in der Realität. Hier ist es noch schöner. Alles in Top-Zustand und genau wie versprochen. Voll ausgestattete Küche, Badezimmer auch super. Sogar ein Haartrockner ist vorhanden. Seife, Duschgel und Shampoo ist auch da. Praktisch, wenn das Gepäck dank der Fluglinie erst zwei Tage später kommt. Herzlicher Empfang am Anreistag mit Tipps zur Stadt und Restaurants. Auch zwischendrin beste Betreuung, jederzeit gute Antworten auf alle Fragen. Sogar ein Stadtplan mit allem Wichtigem wurde für uns gekennzeichnet. Wirklich schön. Sehr familiärer Kontakt. Wir kommen definitiv wieder, absolut empfehlenswert. Un appartement très spacieux sur 2 étages, situé entre la rue Allenbi et la rue Rotschild, pas loin de Neve Tsedek, 10 min à pied de la mer, avec une terrasse au toit avec un jaccuzzi et une vue splendide sur la grande synagogue - en un mot: le lieu parfait pour un séjour inoubliable à Tel-Aviv. Elie, l'hôte de ce magnifique duplex nous a acceuilli personellement et nous a "introduit" à l'appartement et à Tel-Aviv pendant plus d'une heure - il nous a donné une liste avec des recommandations de restaurants, nous a expliqué ou se trouvent le lieux les plus intéressants etc. Ses recommandations de restaurants étaient juste superbes - ne ratez pas à manger une pita au Jasmino, juste au coin de la rue Allenbi pas loin de l'appartement! Merci beaucoup Elie et Carole! Nous allons surement revenir une autre fois. Nous avons été accueillis par Elie et Carole comme si nous étions de la famille .Ils sont présents et à l’ecoute du moindre besoin.Notre séjour à été parfait aussi grâce à eux car ils vous renseignent autant sur l’appartement que sur le pays .Merci a eux .Que dire de plus des hôtes parfaits!! Et l’appartement alors...très agréable à vivre avec ses deux terrasses pour recevoir et se détendre : Jacuzzi !!! et les chambres au calme ,nous avons appréciés les équipements completsde l’appart (tout est bien pensé et optimise) et bien entretenu. We spent some days in Tel Aviv, at the beginning of August, in the “Jacuzzi House”. Our stay was really nice. The apartment was clean, well furnished and at the arrival we found some goods for the primary needs The hosts, a French couple, have been very generous in spending time with us at the arrival, giving useful tips for our stay. And during the week they checked couple of times any further need. The weather was very hot and humid so the house represented for us a good break to rest and recharge the energies. Important to say that the position is really strategic, close to the sea, the bus station for Jerusalem and the French quarter. We gave a full 9 to our stay. Try it! Un accueil formidable par Claude et Carole qui font tout pour vous faciliter le séjour. Un appartement très agréable avec une vue dégagée et bien placé près de ROTHSCHILD et névé tsedek. Très bon séjour dans l'appartement The Rooftop, tout était parfait - accueil très attentif, tout était bien expliqué et il y avait du pain, du beurre, du lait, du café dans l'apt. à notre arrivée. Les deux terrasses sont magnifiques, l'apt. était propre et très bien entretenue. Le lieu est idéal, en plein milieu de la ville avec beaucoup de points intéressants de distance à pied. Tranquille et luxueux, fortement recommandé! Tel Aviv offers an almost exclusive glance at what Jewish life was like in Israel in the late 19th and early 20th centuries. Among the city’s architectural treasures is the Great Synagogue, the first major synagogue built in modern Israel, and for many years the largest synagogue in the Middle East. Designed by Yehuda Magidovitch, this synagogue was built in 1926 and then restored in the 70's. This exquisite example of Modernist architecture is notable for its huge dome and its stained glass windows which were remodeled in the 1970s in tribute to the many synagogues that were destroyed during the WWII. Its construction was, in many ways, an unofficial declaration to the world that the Jews were in Palestine to stay. Until the Belz Great Synagogue was completed in Jerusalem, the Great Synagogue of Tel Aviv was the largest in Israel. It functioned not only as a place of worship, but a place of community and national identity. Somewhat unexpectedly, the square surrounding it is host to a series of hip bars and restaurants. Shopping in Shuk HaCarmel market in Tel Aviv is an experience that shouldn't be missed, especially if you think you have bargaining skills! Here you'll find shops selling fresh produce of every kind, fish, meat, spices, coffee, candy, clothes, etc... As it is slowly being gentrified, you'll also find corners where you can stop for an espresso break like at the Coffee Lab at HaCarmel 21, corner of Rabbi Meir 42, or perhaps have Humus at Hacarmel 11. Located in the center of Tel Aviv, the Nahalat Binyamin market is one of the most popular open air pedestrian mall areas. The stores and booths in the market are an ideal place to find gifts, souvenirs, arts & crafts, toys, jewelry, Judaica, ceramics, etc. In addition, you'll often find the area filled with musicians, fortune tellers, clowns and street theater performances, especially on Friday afternoons. Founded in 1887, Tel Aviv’s oldest neighborhood is undeniably one of its most charming and perhaps most glamorous. Colorful Ottoman-era buildings line cobblestone streets and are home to a variety of boutiques and shops, luxury boutique hotels and hip restaurants, particularly along the neighborhood’s main thoroughfare, Shabazi street. Housed in a former girls’ school built in 1908, the Suzanne Dellal Center for Dance serves as the country’s premiere contemporary dance venue. Israel’s first skyscraper—the Shalom Meir Tower, completed in 1961, was once the tallest building in the Middle East. Despite its post-Bauhaus façade and a somewhat drab exterior, it remains a prominent landmark in the center of Tel Aviv’s first Jewish neighborhood. Another noteworthy building nearby is jeweler Akiva Ari Weiss’s former home (Number 2 Herzl St.), a shining example of a renovated Eclectic-style building and one of few in the area not demolished during the Bauhaus wave of the 1930s. Like others built in the same period, it started as a one-story house before a second floor was added as the city grew. The Bialik district is a village-like neighborhood. It represents Tel Aviv architecture from the 1920s on, with examples of Art Deco and eclecticism, but also with a strong presence of 'white architecture'. It comprises a selection of buildings that became landmarks in the development of the regional language of Tel Aviv's modernism and has been declared a World Cultural Heritage Site by UNESCO. The buildings reflect influences from the Bauhaus, Le Corbusier and Erich Mendelsohn and are characterized by the implementation of the Modernist ideas into the local conditions.